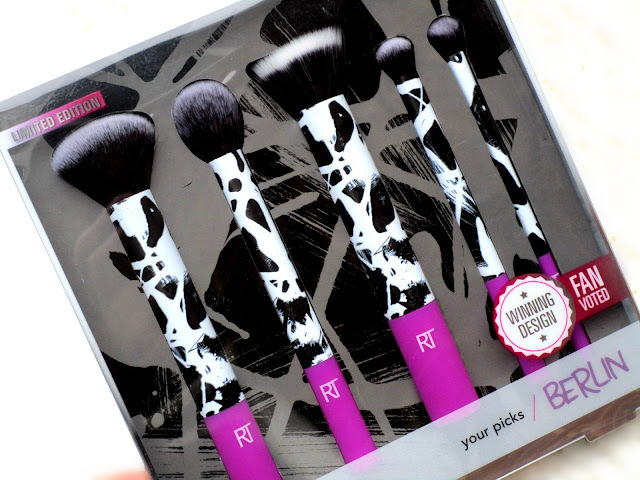 You may have seen in my Boxing Day sales haul (HERE) that I picked up the bargain of all bargains when I spotted the Limited Edition Real Techniques Your Picks 'Berlin' Makeup Brush Set for just £9.99 in Superdrug, so today I thought I'd review it for you all . The Real Techniques Your Picks Berlin Set consists of five fan favourite must-have brushes, theres a Buffing Brush, Contour Brush, Stippling Brush, Deluxe Crease Brush and a Base Shadow Brush, all of which come with the limited edition and fan voted for printed street art handles inspired by graffiti, murals and paintings in Berlin. 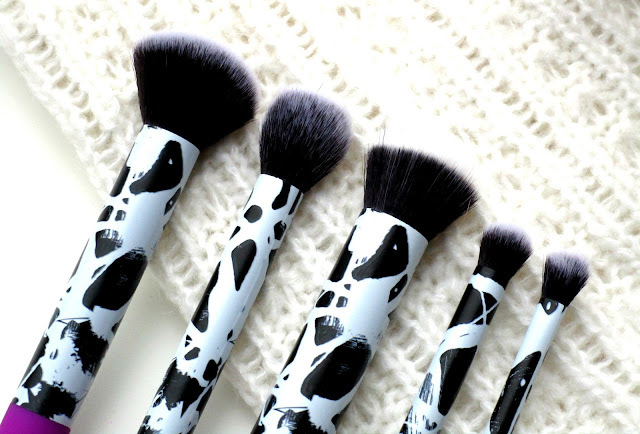 Each brush within the set really is an essential for me during my everyday makeup application, there all such versatile brushes and can be used with cream, liquid and powder products. Theres three face brushes within the set starting with the Buffing Brush, this is ideal for full coverage application of liquid and cream foundation, but to be honest I pretty much use this brush to buff everything in from my finishing powder, blush and even bronzer. 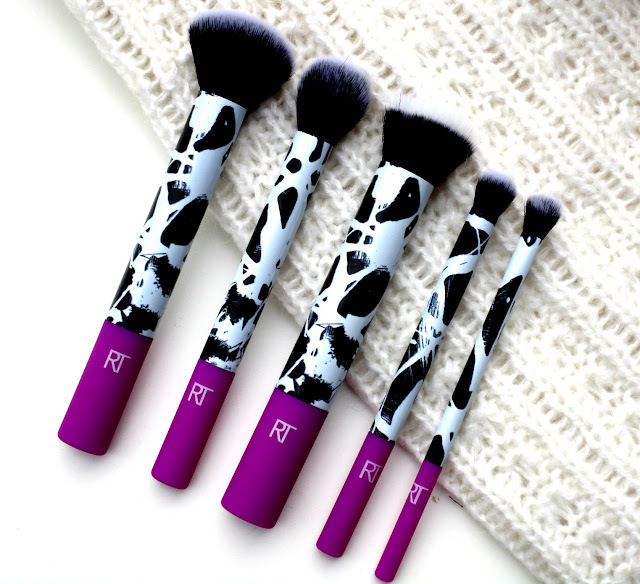 Then theres the Contour Brush, this is the perfect size to add shade and light into the face, it fits into the hollows of my cheeks perfectly to really sculpt them out and even applies highlight with ease (PS - it's great at buffing concealer in too). The Stippling Brush is great for a lighter coverage of foundation, it has duo fibre bristles that work together to create a softer but perfect look, I love this brush for applying cream blushers and bronzers too. Onto the two eye brushes in the set which I have to say are my favourite eye brushes from Real Techniques, theres a Deluxe Crease Brush which I use in so many ways, it's a great brush for blending and buffing in cream eye shadows and is brilliant at blending out powder eyeshadow through the crease too, I've also used this brush for blending in concealer and contouring/highlighting smaller areas of the face, it's a super useful brush. The final brush in the collection is the Base Shadow Brush, this is the perfect brush to pack colour on your lids but can also be used for blending eyeshadow work and it fits lovely under the eyes too. All of the Real Techniques brushes in this Limited Edition Your Picks Berlin Set have light weight aluminium handle's making them really easy to use and have a rubber section at the bottom of the handle for extra grip and control, and all of the brushes are 100% cruelty free too and are made of synthetic fibres which is a major plus. Overall I'm so happy I managed to pick this set up, it was such a steel to get them all for just £9.99 considering the Stippling Brush is £10.99 alone in Superdrug. My Superdrug store actually still have some of the sets left however they are sold out online so if your quick you may be able to nab a set still in store. What do you think of the Real Techniques Berlin design beaut's? I'd love to know!